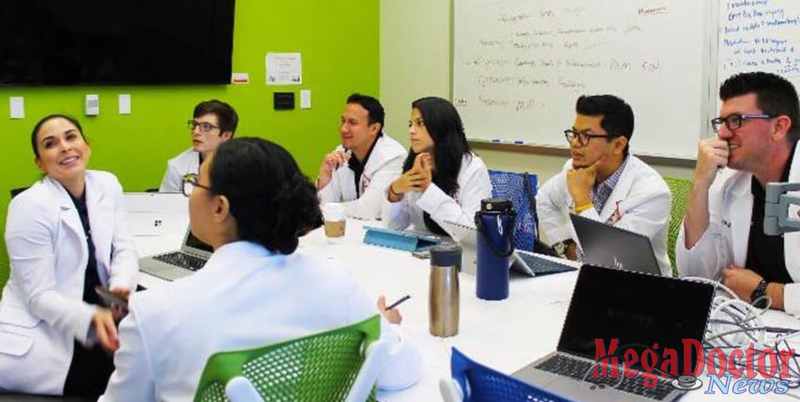 Students from the UTRGV School of Medicine, School of Nursing, and the Physician Assistant Studies Program in the College of Health Professions received an early glimpse into working in a team-based environment to help a patient. The School of Medicine hosted the first Team-Centric Friday event March 1, where more than 160 students – nurse practitioner students, physician assistant students, and first-year medical students – collaborated on how to treat a patient with vision problems. Billings and other students said they appreciated how they were able to complement each other’s skill sets. Where medical students excelled in pathology, the PA and nurse practitioners excelled in clinical presentation skills, they said. The Team-Centric Friday activity was the realization of a shared vision that faculty members from the schools of Medicine and Nursing, and the College of Health Professions, have had in developing interprofessional education opportunities for students, said Dr. Helene Krouse, RN, associate dean for interprofessional education at the UTRGV School of Medicine. Citing the Institute of Medicine’s 1999 patient safety report, “To Err is Human,” Krouse said a high number of medical errors were the result of a lack of communication among healthcare professionals. Having students of medicine and other health-related professions collaborate earlier in their careers can help them become more acclimated to working in a team-based environment and improve communication among healthcare providers, she said. The activity included 16 faculty members from various programs and schools, including internal medicine residents who served as faculty facilitators. These facilitators provided guidance to small interprofessional teams of students as they reviewed the case study. Participating faculty members said they were impressed with how well students from the different programs worked together. Several faculty members said they noticed the respect with which students treated each other and how they helped one another throughout the exercise. “I liked how well they meshed,” said Dr. Jawairia Khan, a second-year medical resident in the UTRGV internal medicine residency program at Doctors Hospital at Renaissance. Despite being from different programs and at different stages in their respective programs, Khan said they knew when to pull back or when to offer their opinions.